There are perks for being a wine blogger. Recently a South African Wine Cooperative, Durbanville Hills, contacted me about doing a wine and chocolate tasting with their Sauvignon Blanc and Shiraz. When they first contacted me, I explained that I was not a sommelier or a wine critic. I am totally incapable of producing tasting notes and I write from the point of view of a wine tourist They repeated the offer. I had been doing a series called Wine of the Week over the winter on this blog site when it was impossible to get out of the house, much less wine tour and many of those blogs had been about wines known for excellent wine and chocolate pairingss, so they still wanted to send me wine and chocolate for sampling. Why did I agree to a South African wine pairing? The decision to write this blog was not due to the offer of free wine and chocolate however tempting that may be. I was born in South Africa when my British parents were posted there with the Royal Navy. 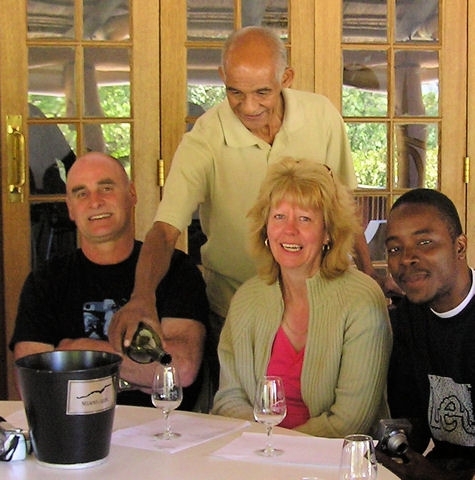 My first wine tour was when I returned to visit in 2005. At the time, I was more interested in the social aspects of post Apartheid South Africa and the wine industry than the wine. (see my blog Raise a Glass of Pinotage to Nelson Mandela) So before I agreed to their request, I asked about their social action programs and I was incredibly impressed by what I read. Durbanville Hills is not in the usual South African wine regions of Constantia, Stellenbosch or Paarl. It is a business run by nine vineyards in partnership with Distell (the South African Wine and Distillery Association) . It is located just 20 minutes from Cape Town with a spectacular view across the bay of Table Mountain. I’ve stood on the top of Table Mountain and have seen this area in the distance before the clouds of the “table cloth” rolled in. Before I even tasted the wine, I liked this winery. It is ISO 14001 approved for its environmental management for using sustainable land use and cellar management. Each bottle of wine has a Sustainability Seal guaranteeing it is 100% South African wine and sourced through environmentally friendly production methods from wine to bottle. The farms, all of which have been there since the 1700s, are part of the Renosterveld an area of endangered vegetation. To preserve the natural habitat of what is called ‘the Cape Floral Kingdom’ they are accredited members of BWI, Biodiversity & Wine Initiative. The South African wine industry’s record of fair labour practices for their agricultural workers ranges from inspiring to socially abusive. Durbanville Hills is one of the former. Since 2000, it has established a Workers’ Trust which has a 5% equity share of the business, a seat on the board of directors and operates several fund-raising initiatives. The Trust supports the education of the workers’ children through a daycare for preschool children, improvements to the under resourced local school including computers and sports equipment and all the children who wish to attend high school are sponsored. In addition, life skills programs are offered for workers on the farms including literacy, health education, financial planning and alcohol abuse awareness. The company received the Ethical Award in 2011 from the Drinks Business Awards. One of their big success stories from the Trust is Mervyn Davies, a worker who has taken advantage of the Trust’s educational programs and is currently Cellar Coordinator at Durbanville Hills. He has recently received a bursary to enter a formal winemaking education program later this year. Within two days of agreeing to the tasting, a bottle each of Durhamville Hills Shiraz and Sauvignon Blanc arrived along with two small boxes of chocolates. My family were visiting for the weekend so the adults had a formal pairing after the grandkids went to bed. It should be said that if ever Durbanville Hills go out of the wine business, they could make a fortune in chocolate sales. Absolutely amazing chocolate that seems to have been developed solely with these wines in mind. The Morning Mist white chocolate had flavours of lime, fresh green apple, sea salt and ginger, the chocolate was low sugar and so the flavours seemed to float on a light cream base. The Sauvignon Blanc had notes of lime, grapefruit green fig and grass. The combined lime and tartness of green apple and grapefruit extended by the touch of salty spice and ripening fig were delightful with a flavour that lingered pleasantly on the palate. There was a collective “Yummm!” around the table. The South Easter milk chocolate was infused with the flavours of cardamom, cinnamon, nutmeg and cloves and was paired with the Shiraz redolent of pepper, fruit, cloves and spices. My eldest cheated and bit into the chocolate first, “It tastes like Christmas!” she said then washed it down with a gulp of Shiraz “Absolutely amazing.” It was a really terrific pairing and the spices were definitely Christmassy. It was a delightful experience; however, finding the right chocolate and the right time for chocolate pairing is a little contrived. I tried the rest of the Shiraz with barbecued steak the next night and the spiced dark fruit and pepper flavours with steak made for a wonderful taste experience. I think the Sauvignon Blanc would have gone extremely well with a Thai stir fry; unfortunately, none was left. Luckily, both these wines are sold through the LCBO for about $11.95. When my pledge to drink only Canadian wine for a year (other than for wine tasting activities like this) is over in September, I’ll pick up a few bottles and see what else it pairs with. As my wine tasting reviews are really not the professional type, I’ve added links to what some of the pros are saying about these wines. Brett Gagnon The Canadian Wine Guy wrote up the Durbanville Hills Shiraz The WineAlign team gave the Durbanville Hills Sauvignon Blanc 4.2 stars and it is one of Margaret Swayne’s picks. Let me know your thoughts about them as well. Does a winery’s ethical behaviour influence your purchase? Fun post, Veronica! You know me. I love playing with wine and chocolate pairings. Will be doing more of it in volume II of Chocolatour. And yes, it is indeed important to me regarding the ethical practices of the winery. And I’m trying to buy an increasing number of organic wines. cheers! Thanks Doreen as the Chocolatourist you would have loved these chocolates. Very unique.